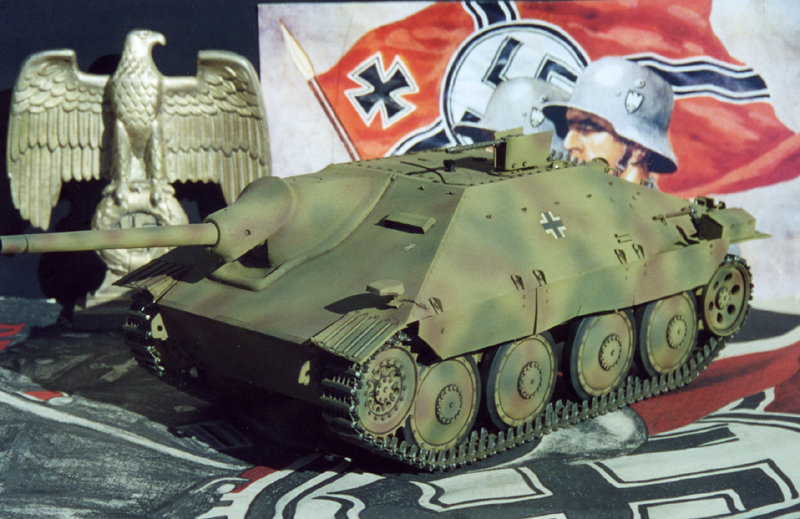 JAGDPANZER 38(t) HETZER TANK DESTROYER IN 1/15 SCALE. Panzerjager (tank hunter) actually includes anyone who engages in seeking out and destroying enemy armor. One of the many armored fighting vehicles developed by the Germans for the sole purpose of seeking out, hunting and destroying enemy tanks was the Jagdpanzer 38(t) Hetzer tank destroyer. Utilizing the chassis of the versatile Czech Panzer 38(t), the Hetzer was created by widening the tank chassis for more room in the fighting compartment, adding a heavily armored superstructure that provided all around protection, a ballistically very effective shape with no vertical plates, and arming the vehicle with the high velocity Pak 39 75mm anti-tank gun, the vehicle proved to be a small, robust, compact and presented a low silhouette and packed a heavy punch. With its small size and low silhouette, this Jagdpanzer 38(t) Hetzer could hide itself in wrecked buildings or small thickets, when enemy armored vehicles came within the Hetzer�s gun range, it would strike with devastating results, punching holes into Bolshevik T-34�s and imperialist aggressing Sherman Tommy Cookers to great effect. For close defense against enemy personnel, it had an internally controlled machine gun on the roof plate that reaped a deadly harvest of enemy soldiers with bursts of machine gun fire. The Hetzer was one of the most successful developments in German tank design, similar to an assault gun, but with a wider, flatter profile, and with its tortoise shell-like form, it was very well received and liked by its crews. After the war, the Hetzers were still in use well into the 1970�s by the Czech and Swiss army, making it the longest living and existing tank design in service in the world. Certainly no other combatant in World War II fielded such a variety of armored vehicles as did the Germans. The Teutonic preference for carefully-crafted machines, collided enough times with the demands for mass production and redesign, to ensure students of armor an intriguing array of armored fighting vehicles to study for years to come. One often wonders and we ask ourselves: Why German armor has long held such fascination? There is only one reason, it is because they looked the part: Capable, Efficient, and above all; Lethal. One can imagine this Jagdpanzer Hetzer, with its sloping armor and vaulting drive sprockets, ranging over the battlefield, stiff-arming its opponents with its lethal 75mm gun until the odds against it simply became overwhelming. While the assortment was impressive indeed and the technology enviable�.. their Epic tell the story.